If you look at the emergency room of a hospital, the doctors and surgeons are brilliant at being ruthlessly efficient. They triage patients and prioritise the work based on who's coming in still walking vs. people who are on stretchers or dead. We can apply a similar process to your email Inbox and better yet, the Inbox of our life. 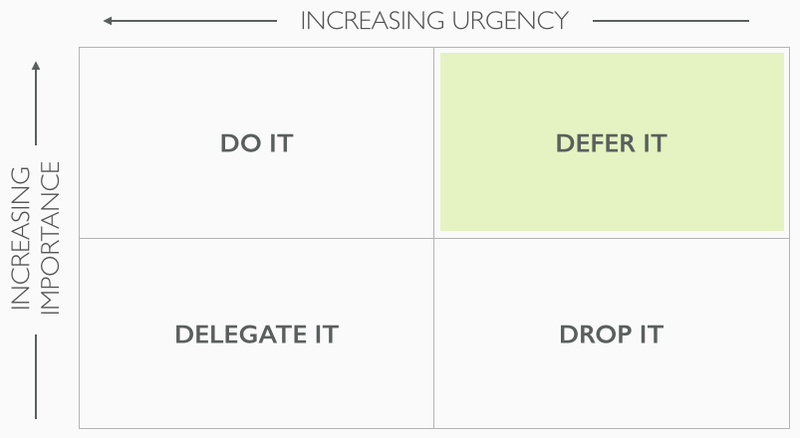 Do it: Only do it if it's important and urgent and doing it will only take a minute or two. Defer it: Defer it to later if it's important but not urgent. Schedule a time in your calendar when you can come back to it. Delegate it: Pass it on if it's more suited to someone else or not worth your time. Generally when it's urgent but not important. Drop it: Finally you can drop it if it isn't important or urgent. Don't be afraid to do this. Unread email is the same as the people walking or being carried into the ER. Those emails are patients waiting to be triaged. The great thing about this system is that you can apply it to the Inbox of your life: e.g. bills, errands and house work. Things that enter your routine can be triaged based on their priority. Don't worry about paying individual bills as soon as they come in. Batch them and handle them all at once. This can be once a week if you're worried about missing a payment but preferably once a month. Most people try and do things right away with no sense of priority. What they should really be doing is deferring work for later, delegating it to others or dropping it all together. Ultimately doing it straight away is what kills our productivity as we waste time on tasks that don't deserve it. Don't make this mistake and don't be afraid to drop the ball. Instead defer as much of the important work as you can for later. This is your ‘project' work that gets entered into your calendar to be dealt with at a time that suits your routine. Doing this, and reducing your amount of ‘Do it' work allows you to race through email a lot faster so you can then focus on the ‘Defer it' tasks that require more in-depth thought. This technique is simple and easy to adopt. To start with, I suggest writing the 4 D's on a sticky note and attaching it to your computer. Along with other productivity techniques like batching your email, you'll be achieving maximum email efficiency in no time.